Albert Huddleston has all the money in the world, and he’s spending some of it to build a private golf Shangri-La. Albert Huddleston’s obsession with golf began to manifest in the second grade. In Maryville, Tennessee, at the base of the Smoky Mountains, in Mrs. Payne’s class at Fort Craig Elementary, young Albert would sit in the back row and give every impression that he was bearing down on his schoolwork while he was actually sketching World War II bombers—and golf holes. Both interests sprang from his father, Gordon, who had flown B-17s and B-29s from the factory floor to combat airfields across the pond as a celestial navigator in Europe and North Africa. After the war, Huddleston père won many amateur golf tournaments in East Tennessee. He played in an exhibition match with Sam Snead once and was involved in building Fox Den Country Club, in Knoxville. They kept a closer eye on doodlers, presumably, at the McCallie School, the all-boys military academy in Chattanooga that Huddleston attended as a boarder from age 14 through high school. “Honor, Truth, Duty” were the bywords at McCallie, where students learned to march, to maintain and shoot an Army surplus rifle, and to look sharp in the seven-days-a-week uniform—black tie, black shoes, blue shirt, navy pants with a stripe down the side. When his father was diagnosed with kidney cancer during his senior year, it was a major blow to cadet Huddleston. 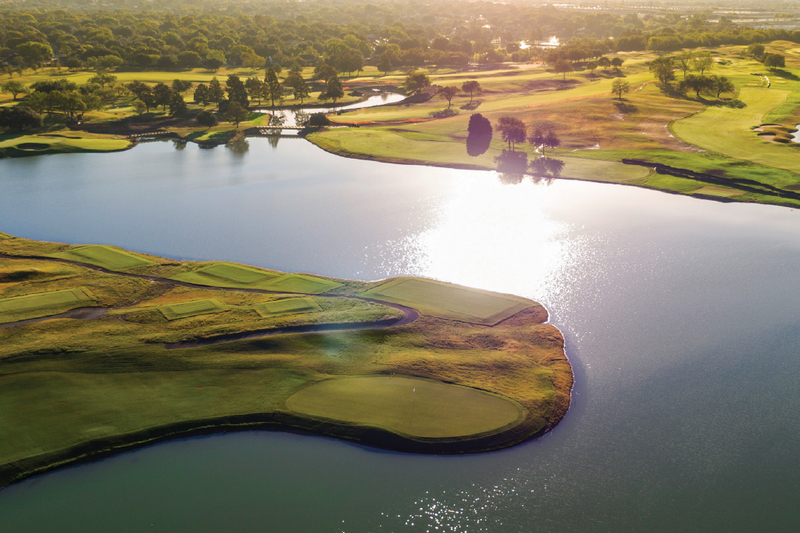 PLAYING THROUGH: After buying the former Columbian Country Club of Dallas, Huddleston scraped away all traces of its course, carving out a 31-acre lake in the middle of the land and using the resulting 660,000 cubic yards of silt to sculpt greens and tees and berms. After a stint with an oil company in Houston, and another with Hunt Energy, Huddleston started his own companies and met with great success. He was a risk taker, but good at figuring odds, and his carefully calculated bets paid off. It was big news in the industry in 2015 when his Aethon Energy acquired a big chunk of SM Energy holdings in Arkansas, Louisiana, and Texas. These assets, according to a press release, had “considerable upside optionality” and “compelling asymmetric returns,” two things we all want. Not every well comes in, of course. “He’s pissed off some people in the Dallas investing community,” says a member of the Dallas investing community. “But I guess that’s why they call it ‘risk.’ ” Huddleston’s Hyperion Resources tried to build a green refinery on 5,000 acres of South Dakota to process the oil out of Canadian tar sands. There were no returns, asymmetric or otherwise, and the refinery wasn’t built. Nor did upside optionality show its pretty face when, after a very long struggle, his Legacy Hillcrest Investments could not get approval to develop the old Chase Bank office tower at Hillcrest and Haynie, in University Park. Other blood-curdling conflicts were part and parcel of being a Hunt-in-law. For example, in 1985 the IRS sent a love letter requesting $250 million in back taxes from the Hunts; Albert and Mary’s portion was $53 million. Something about treating loans from the trust as gifts, or vice versa. Then there was the yearlong court battle with his mother over their trust fund. In all this storm and stress, Huddleston has had a happy place: the golf course. That is the key to understanding him. For not only is he a very good golfer, he is a golf nut of the highest order. For purists like him, the simultaneously solitary and social pastime is as much religion as sport—probably more. Formal competition is a sacrament; calling a bunker a “sand trap” is a venial sin. For less ardent members of the congregation, golf is four hours of sweaty fun and frustration with beer at the end, possibly during. But the ancient game’s lofty ideals trip off the tongue of the true believer: sportsmanship, camaraderie, honesty. Which brings us to 212 acres in Carrollton that Huddleston now owns. In July, he plans to officially open a golf course with high ambitions indeed. Its name is a portmanteau of his wife’s childhood moniker: Maridoe. It’s an oddball name that thumbs its nose at the usual column A reference to trees—oaks, pines, willows, and so on—and column B shoutout to terrain—lakes, rivers, hills, and dales. “Maridoe” shouts that Huddleston’s dream course will defy convention. From its difficulty to its seemingly infinite budget to its world-class croquet court, Maridoe is breaking all the rules in this game. It’s Huddleston’s vision, after all, and he’s paying the bills. Although he is famously media averse, on a cool sunny day a few months ago, Huddleston pilots a golf cart between backhoes and dozers to show me the construction project that is consuming big piles of his money. Developer Dan Deichert drives his own club car alongside us. Huddleston, 64, has a reputation for a sharp mind controlling sharp elbows, but his soothing accent and disarming tone might put you in mind of the late Fred Thompson, the actor who became a U.S. senator from the Volunteer State and ran for president in 2008. We pause on high ground. I swivel my head. The enormity of the tableau makes it seem as if Carrollton has become the plains of Giza and the army of hard-hatted workers below us are building pyramids, not golf holes. I search in vain for vestiges of the original tenant, the Columbian Country Club of Dallas, opened in 1951. It was a good track, but by the time Huddleston acquired the place, it was operating as The Honors Golf Club, the name cribbed from his Tennessee Shangri-La. But rather than remodel, Huddleston scraped away all traces of the Columbian. How many millions Huddleston is spending he will not say. I’m guessing 30. The current complete renovation of the venerable Northwood Club in North Dallas, by comparison, will cost about $14.5 million. He’d searched for 20 years for local ground on which to build Honors west. He was a week late with an offer to buy the land that became Dallas National, the exclusive club built in 2002 on a West Dallas lot that had been a quarry. Huddleston bought his land in 2014 and then did things with it that signaled he doesn’t give a damn about making money on this deal. First, he let his ground just sit there for a year and a half while he organized and thought and, under the direction of architect Steve Smyers, tested four types of fairway grass and seven kinds of bunker sand. APPROACH SHOT: Huddleston and developer Dan Deichert (in cart) haven’t decided if they’ll keep the Columbian’s clubhouse. They’re taking their time. 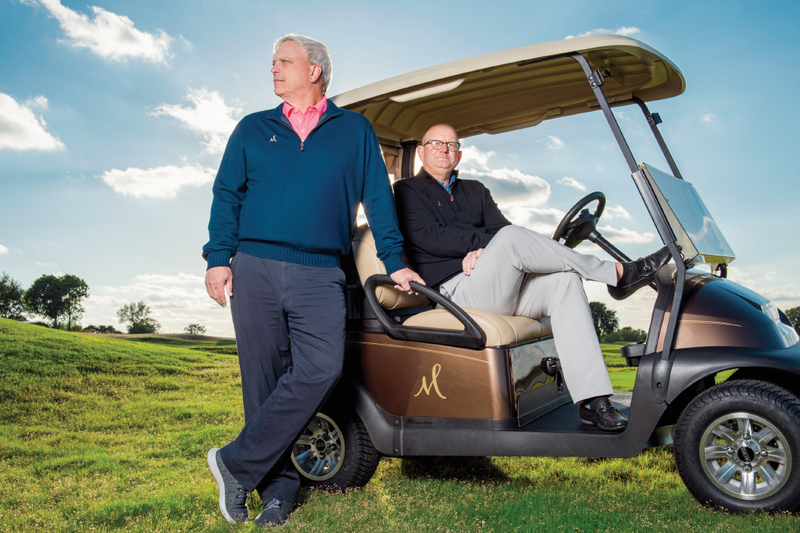 “We’re ignoring how the rest of the golf world organizes themselves,” Huddleston says. For a while, we regard the 31-acre lake in the middle of the property, an irresistible sight, what with its clear blue water sparkling like the Caribbean in a Sandals Jamaica ad. “We got 660,000 cubic yards of silt out of it,” Huddleston says. For weeks, three giant track hoes dug simultaneously, filling the beds of a dozen dump trucks. About 30,000 truckloads later, architect Smyers had an unexpectedly large volume of dirt for sculpting greens and tees and so on. Can you imagine the expense—of diesel fuel, labor, equipment rental? But they’d recycled the dirt, which is important to the owner. He recycles trees, too. Huddleston required a conference any time project coordinator Patrick Andrews wanted to start a chain saw because he loves trees to the point of—well, no one anywhere transplants nasty, thorny mesquites, but Huddleston did, along with many enormous oaks and crape myrtles. And he is intrigued by what he calls the “kinetic sculpture” and “ethereal wispiness” of native grasses swaying in the wind. So it’s shabby chic in what golf architects call “out of play areas,” where Maridoe is reintroducing drought-tolerant varieties that sound like they arrived from a Denver dispensary: purple threeawn, blue grama, and Topgun Buffalograss. This stuff wants no fertilizer, no insecticide, and little water. The real Maridoe won’t reveal itself until this summer, when our annual drought hits—and the superintendent doesn’t turn on the sprinklers. I returned a week later and played a few holes with Deichert. Once upon a time, I was a very bad professional golfer, and though I’ve aged I still have some game. But not enough. At 7,800 yards from the back tees, Maridoe is about half a mile more than I can handle, and the shots to its greens seem to require strength and subtlety I do not possess. And now an interesting conflict brews. Deichert bragged to me about Maridoe’s wonderful location. It’s just 20 minutes to DFW Airport and only five to Addison Airport, for those of us who prefer to fly private. Also there are 8,000 paved parking spaces within 3 miles of the course. Why would parking matter? It’s clear that Maridoe covets the same thing as that other new course on South Loop 12. 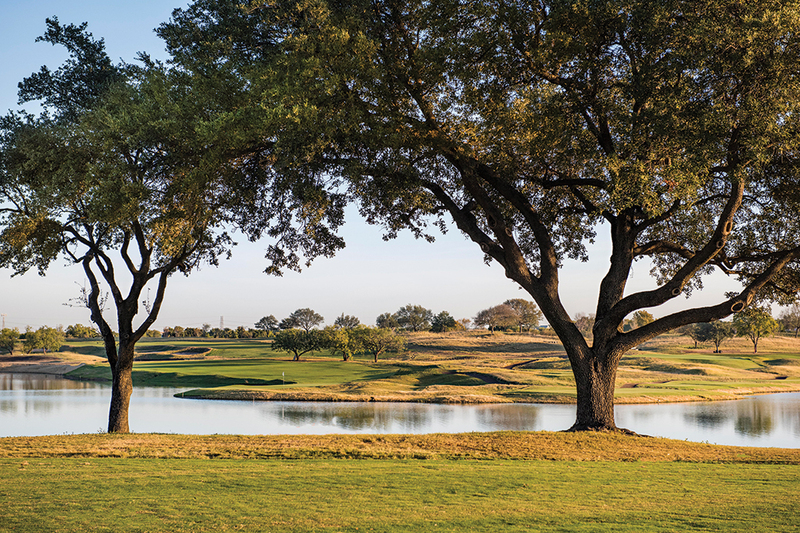 You’ve read about Trinity Forest Golf Club. That it’s built on a nearly treeless, sand-capped landfill doesn’t sound promising, but inspired sculpting of dunes and hollows transformed the old dump into a roller coaster of a golf course that may be a masterpiece. The club will host the Byron Nelson tournament starting next year, but it’s after bigger fish. Page one, sentence one of Trinity Forest’s website declares that the course “was created explicitly to attract prestigious golf championships back to Dallas.” This is code for “We want the U.S. Open.” Precisely the aim of Maridoe. Northwood hosted the U.S. Open in 1952. Dallas Athletic Club hosted the PGA Championship in 1963. 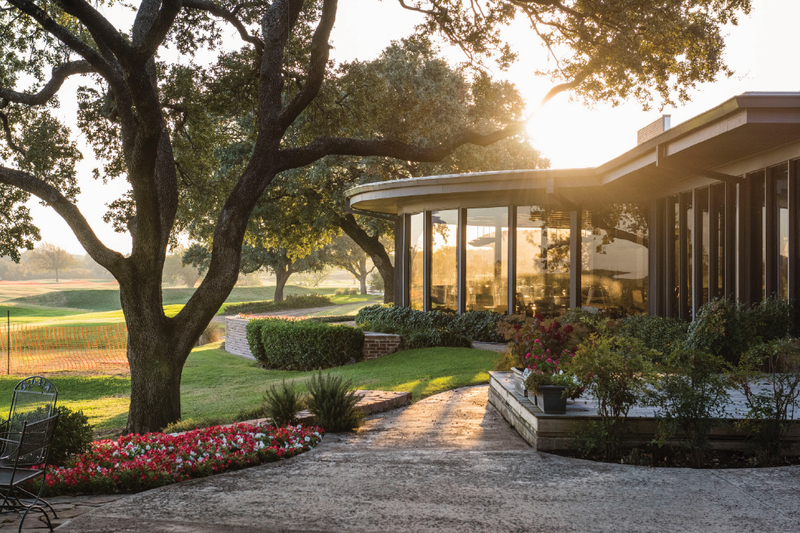 For the two majors that could possibly be played in Dallas, it has been more than 50 years. They’ve stayed away because of our summer heat, right? Wrong. A USGA insider says it’s our grass. The greens on virtually all our high-end clubs are covered in a fine-bladed northern variety called bent. Bentgrass hates it here. Although bent provides a smooth, lovely surface eight months of the year, it requires so much water in the summer that it scars easily, putts slowly, and makes a squishing sound when you walk on it. Now comes a miraculous new strain of heat-loving Bermuda called Champion ultradwarf, which grows vertically, putts like waxed concrete, and requires little water. Maridoe’s got it, and so does Trinity Forest. 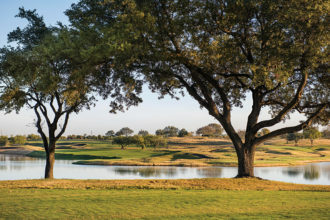 Three months after it opens, Maridoe will host the Texas Shootout, one of the Texas Golf Association’s biggest tournaments. After that, who knows? Perhaps the LPGA or the PGA will come calling. 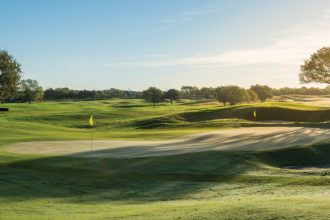 Maybe Trinity Forest will fumble its first Nelson next spring or maybe Trinity Forest will acquit itself so well that it gets the holy of holies, the U.S. Open, and the Nelson will have to move for a year or two. The coming months will be exciting ones for Huddleston. That little boy in the back of Mrs. Payne’s second-grade class grew up to see his doodles come to life. Now all that’s left is to go outside and play. Curt Sampson has written 15 books, most recently Furious George, about NBA coach George Karl (HarperCollins).